The Wychwood Barns share their name with the Toronto neighbourhood near which they stand; two blocks south of St. Clair Avenue West, hemmed in by Christie Street, Wychwood Avenue, and Benson Avenue, and only just north of the small, distinct community known as Wychwood Park. Consisting of twenty-two well treed acres between Davenport Road and St. Clair Avenue (a short distance west of Bathurst Street), the park was established in the 1870s by the English painter Marmaduke Matthews and his friend, Alexander Jardine. The two men bought twelve acres jointly in 1877 (with another ten already belonging to Matthews), and began what they envisioned as an artist colony. Even now, over one hundred years after its beginning, Wychwood Park consists of only sixty houses, and it was the first residential neighbourhood in Toronto to be named a Heritage Conservation District under the Ontario Heritage Act. The Wychwood Barns are not quite as old as the Park, but they too have a respectable (if not very dramatic) history attached to them. The first Barn was completed in 1913, and the last one went up in 1921. Originally, the Barns were designed to maintain and repair streetcars, and they functioned in this capacity for over half a century, serving as many as ten routes at their peak, as well as functioning as a development and test area for new streetcars. As the Toronto streetcar system evolved, the importance of the Barns began to fade. In 1978, the buildings were disconnected from the city track system, and all personnel and cars were moved to another site. For twenty years, the facilities were put to a variety of transit-related uses, such as storing old streetcars before their final trip to the scrapyard. Eventually, the cost of keeping and updating the property caused the Toronto Transit Commission to pass it back to the City of Toronto in 1998. The task of restoring and transforming the Barns was eventually given to Artscape, the not-profit organization responsible for such notable Toronto regeneration projects as the Distillery District and Toronto Island Gibraltar Point. 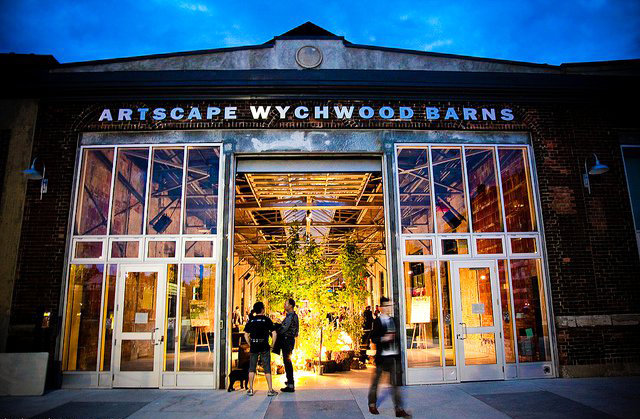 Artscape partners in the Barns project included the City of Toronto, The Stop Community Food Centre, and several other groups (such as the Taddlewood Heritage Association and Wychwood Heights BIA). Both community consultations and a study of existing European and North American examples took place to create a final vision for the Barns. The actual physical reconstruction took a little over a year — from March 2007 to October 2008. 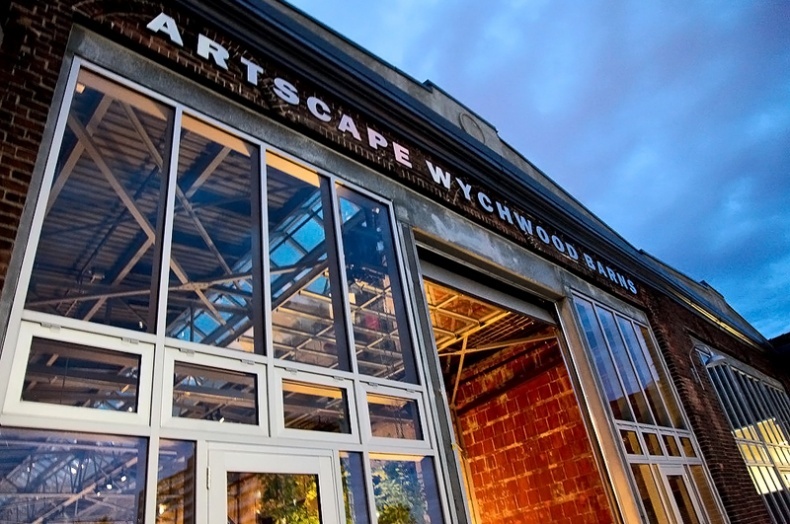 Since their official reopening, the Wychwood Barns have served as a particularly artistic and environmentally-conscious community centre. Although connected and functioning essentially as one building, each barn is referred to separately and offers distinctive services. The Covered Street barn, or Barn Two, is perhaps the closest to a conventional community centre, offering rental space for community events such as festivals and art exhibitions. Barn Three is geared more towards local environmental and arts groups. Barn One, the Studio Barn, contains working and living space for twenty-six artists, as well as extra studios and a community gallery exhibiting local work. The Stop Community Food Centre runs the Green Barn (Barn Four, which includes a food education centre, greenhouse, community kitchens, and outdoor components consisting of a bake oven and a sheltered garden). Barn Five is a framework with neither walls nor roof, and acts as a sort of intermediary between the rest of the barns and the park lawn to the south. The Stop Farmers Market (one of the two largest in the city) is held every Saturday at the Barns, spread around outside during the warm weather and inside Barn Two during the cold months. Julie Kinnear in This Week In Real Estate Video	SAVE THE HIGH PARK ZOO – VOLUNTEER THIS WEEKEND!! !